Grasshopper is out of beta and integrated into Rhino’s core. It now supports HDPI screens and includes multithreading for some components. 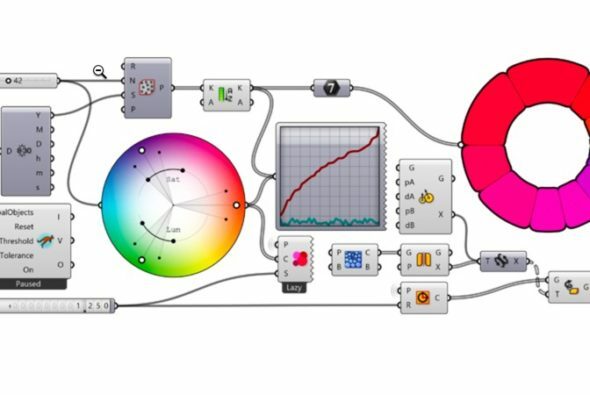 Grasshopper includes new components, including Make2D, Symbol Display, Bend, Flow, Maelstrom, Splop, Splorph, Stretch, Taper, Twist. Kangaroo is added, an interactive relaxation solver and physics engine. Snapshot mode to save and return to states of appearance in models. A new raytraced viewport mode. Improvements to simplify material creation, decal placement and UV unwrapping. Speed and quality improvements to display pipeline. Improvements to the documentation pipeline including a completely reworked annotation-style interface, better DWG support, and support for RichText. Improvements to Make2D including an improved UI, dashed hidden line layers, a new Grasshopper Make2D component to create compositions with custom logic, support for clipping planes, support for whole scene silhouettes. Rhino costs €995 for a new perpetual license, and Rhino 5 users can upgrade for €395 until 15 May 2018, after which time upgrades will cost €395. Find out more about what’s new in the new release on the Rhino website.